Los Angeles, Calif. (May 24, 2016) – Fathom Events and EchoLight Studios present “VANISHED | Left Behind: Next Generation” for an exclusive one-night cinema event in select U.S. theaters Wednesday, September 28, 2016 at 7:00 p.m. local time. Inspired by the New York Times best-selling book series by Tim LaHaye and Jerry B. Jenkins, the production stars Amber Frank (“The Haunted Hathaways”), Dylan Sprayberry (“Teen Wolf,” “Man of Steel”) and Mason Dye (“Finding Carter,” “Flowers in the Attic”), among others. Following the feature, audience members can enjoy a Q&A with the cast and crew (Frank, Sprayberry, Dye and Keely Wilson), hosted by nationally-known speaker and youth leader, Doug Fields. Tickets for the “VANISHED | Left Behind: Next Generation” event can be purchased online by visiting www.FathomEvents.com or at participating theater box offices. Fans throughout the U.S. will be able to enjoy the event in nearly 300 movie theaters through Fathom’s Digital Broadcast Network. For a complete list of theater locations visit the Fathom Events website (theaters and participants are subject to change). 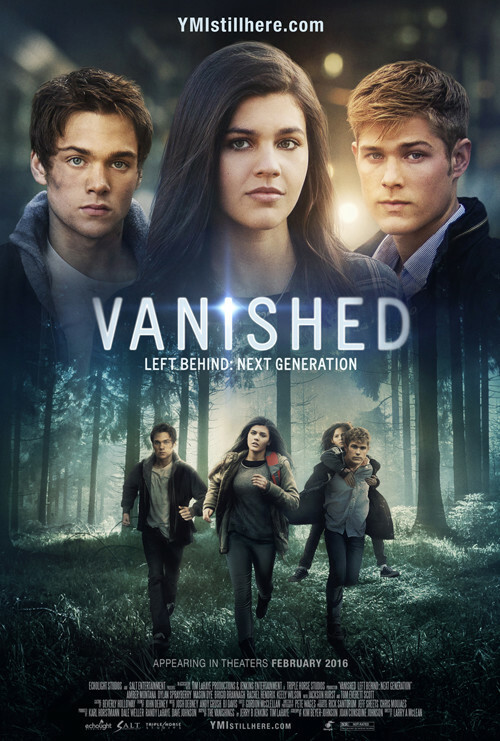 “VANISHED | Left Behind: Next Generation” follows headstrong 15-year-old Gabby (Frank) who is thrust into adulthood way too soon when a billion people around the globe suddenly vanish, and chaos engulfs the nation. The event forces Gabby, along with her younger sister Claire (Keely Wilson) and the two teen boys vying for Gabby’s affection, Josh (Dye) and Flynn (Sprayberry) — to figure out what has happened and how they fit into this dangerous new world. The full cast also includes Tom Everett Scott (“That Thing You Do”), Jackson Hurst (“Drop Dead Divas”), Brigid Brannagh (“Army Wives”) and Rachel Hendrix (“October Baby,” “Perfect Wave”). Salt Entertainment, formed by entertainment industry veterans, Dave Alan Johnson and Steve McBeth, produces high quality projects for film, television and digital markets in the U.S. and around the world. Salt focuses on content targeted for markets largely underserved by mainstream Hollywood, with an emphasis on positive and uplifting values, faith-related projects, and stories using humor, honesty and heart to touch this audience at the deepest level. Salt is committed to a standard of excellence in quality and execution for its projects, to both serve its core audience, and then to cross-over with the same content to a broader general market. For more information, visit www.saltentertainmentgroup.com. EchoLight Studios is committed to bringing relevant, redemptive and powerful entertainment to the marketplace through productions of the highest cinematic quality. From action-adventure, comedy and dramas based on true events, EchoLight delivers feature films which are family-friendly, entertaining and that inspire the human spirit. For more information, visit www.echolight.com. Win “The Finest Hours” on Blu-Ray!